Many working equines in the developing world are suffering in a chronic state of malnutrition. Not only does this cause tremendous suffering, but it can lead to death, which will cause economic devastation for the very poor owners who depend on them and are already living in poverty. With Your Support, Brooke USA Can Help Them! Working equines in rural areas experience the same gastric energy use after activity as do equines who are used for sports competitions. However, unlike sport animals, working equines do not regain their energies as easily because of the inappropriate diet that they have available and the lack of nutritional supplements that are available to them for economic reasons. Therefore, we look for local nutritional alternatives that can meet the need and which are also low-cost and easy to find to assure sustainability. Appropriate feeding is a vital component of animal welfare. Malnutrition of working equine animals in developing countries is common, due to lack of knowledge, cost constraints and unavailability of adequate uncontaminated feed. Improper feeding can result in higher susceptibility to diseases, potentially the animals' ability to work, as well as their life span. Malnutrition is one of Brooke's primary challenges in many areas where Brooke USA is funding equine welfare programs. When an animal fails to receive the nutrients it needs from its diet, its suffering is increased, it loses body condition, becomes underweight, lacks energy, and is unable to perform its work effectively, and will likely die prematurely - any of which will also adversely affect the poor families who need a healthy working partner to help them earn a living. In many poor regions around the world, Brooke USA funds programs through Brooke that encourage and facilitate the formation of local equine welfare groups and associations among equine owners. The regional associations (usually 10-12 smaller community equine welfare groups) are tremendously helpful in improving the welfare of the animals in those communities and beyond, while helping the owners as well. These welfare associations are encouraged to buy feed in bulk at a cost savings to each member. The group members are also encouraged to pool their limited resources to create emergency savings to help in the event of an animal becoming sick or injured. Brooke India developed a software package in conjunction with nutritional scientists that aimed to: 1) assess the nutritional needs of working equids according to body weight and work type, and 2) identify how these could be met with locally available ingredients using local feeding practices. This resulted in a new balanced feed formulation utilizing locally sourced ingredients. A pilot project was then developed for some of the working equines in Manpur village in which owners fed the new feed formulation for four weeks. Owners described their animals as more alert, having a higher quality coat, overall improved health and having an increased ability to cope with their daily work. All owners adopted the new feed formulation as they found that the formulation was cheaper than what they had been feeding, but also more nutritious for their animals. Seeing the positive impact of this feed formulation, the pilot project expanded to include 12 villages, and now more owners are using the feed. This group of satisfied owners will be a good source of exposure for this new feed formulation for many surrounding districts. This owner is a member of an equine welfare group that has, with Brooke's encouragement, purchased nutritious feed in bulk to save money. This mule in Manpur village works all day in a brick kiln -- one of the harshest working environments for animals and owners. Nine-year-old Nasir is the son of a donkey owner who works at a nearby fruit market. He has always seen his father wake up early in the morning, grooming and preparing his donkey for work. He was visited by the Brooke team in his school where he was shown how to handle equines and other animals in the house and how he can help his father care for their donkeys. This is Arvind. He likes to play with his family's mule at the end of each work day, but it's also his responsibility to care for the mule. So Arvind has been applying the instruction that a Brooke veterinarian has given the family to keep their mule healthy. These donkeys in Afghanistan work hard all day, then have to work nearly equally hard to find enough food in the overgrazed, dry terrain. Brooke has been working in Afghanistan since 2000 to improve the welfare of animals in that war-torn country. This owner is gathering greens for his horse. His horse doesn't have access to grazing, so he has been taught by Brooke to supplement his horse's diet with green fodder to aid the horse nutritionally and to help with digestion. Equines are frequently used to transport feed for other livestock which are considered more valuable than they, such as cattle, goats, camels, and sheep, with little regard given to the nutritional needs of the equines who are doing all of the work. A Brooke emergency feeding program during a drought in Senegal utilized water troughs to feed many starving horses at a time. Brooke supplied emergency feed for thousands of animal victims of floods in India. A devastating earthquake hit north west Pakistan, killing tens of thousands of people and millions of animals. Brooke treated thousands of animals - horses, donkeys and other livestock - and helped to rebuild lives by providing animal shelters and fodder. Here a Brooke vet is discussing proper feeding with a group of owners after the earthquake. Anthony, age 13, feeds his donkey in Mwea, Kenya. Anthony’s father doesn’t feed the family’s donkey, but gives all the food to his goats instead. But Anthony attends Brooke's "Donkey Care Club" at school and has learned that this is bad for the donkey, so now Anthony takes it upon himself to ensure that their donkey is fed every day. Desh Raj making up his feed mix at his shop in Goyali village, India. 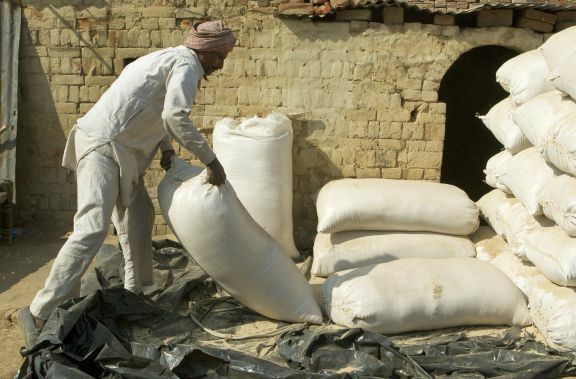 Equines working during the brick kiln season require fortified feed, particularly a mix higher in protein and energy. After attending a Brooke talk for equine group leaders, local shop owner Desh Raj was convinced he could produce a cost-effective energy-efficient feed. This is Gabriel and his mare, Golondrina, in Guatemala. Gabriel's family earns a living with Golondrina as she transports cauliflower and other produce. When she lost her appetite Gabriel's father with Brooke's partner ESAP discovered sores in her mouth caused by eating dry food. The mare's food is now soaked in water before giving it to her, and the problem quickly cleared up. Brooke encourages owners to take feed and water with them so their animals can be reenergized during long work days. A carriage horse in Nicaragua has to summon the strength to work each day in spite of being emaciated. Laxman Gautam has worked as a pony trekking guide in Nepal for the past 15 years, with his 10 horses. Laxman is a passionate animal lover and his equines are extremely important to him. Equines generally work in 5-6 hours shifts often without breaks. Saddle wounds, colic and joint problems are some of common problems found in ponies/horses. Brooke has been training farm owners like Laxman to improve welfare of working ponies in Pokhara. A crystal of local salt at the DBF kiln, Uttar Pradesh, India. A block of this provided as a ‘salt lick’ for the equines while feeding replaces minerals lost from sweating the heavy work, alongside hydration with regular buckets of water.